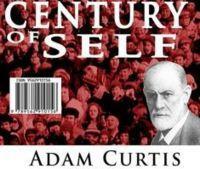 I just watched The Century of the Self, a BBC documentary by Adam Curtis. Curtis' documentaries usually present a fairly clear, but somewhat unexpected and controversial, opinion, which I usually seem to agree with. And he has a certain style, where most of the documentary is put together of footage he has dug out of BBC's archives, and he narrates them himself. I've previously seen The Power of Nightmares, which essentially outlined how the US NeoCons and certain radical militant muslim factions in the Middle East have a whole lot in common. The Century of the Self, on the other hand, is about how the masses are manipulated through the use of various tools and theories from psychology and the social sciences, as applied to PR and politics. See, he particularly tracks the legacy of Sigmund Freud, as championed by his daughter Anna and his nephew, Edward Bernays. Bernays is considered the father of the whole subject of public relations. More directly, he became a master of mass manipulation, showing first large companies and then politicians how to effectively influence the masses. "If we understand the mechanism and motives of the group mind, is it not possible to control and regiment the masses according to our will without their knowing about it? The recent practice of propaganda has proved that it is possible, at least up to a certain point and within certain limits." Before Bernays, one would sell products mostly based on their qualities. "It is really durable", "Your curtains will be more clean", etc. But he invented the whole idea of appealing to people's subconscious drives instead. The conscious and intelligent manipulation of the organized habits and opinions of the masses is an important element in democratic society. Those who manipulate this unseen mechanism of society constitute an invisible government which is the true ruling power of our country. ... We are governed, our minds are molded, our tastes formed, our ideas suggested, largely by men we have never heard of. This is a logical result of the way in which our democratic society is organized. Vast numbers of human beings must cooperate in this manner if they are to live together as a smoothly functioning society. ... In almost every act of our daily lives, whether in the sphere of politics or business, in our social conduct or our ethical thinking, we are dominated by the relatively small number of persons ... who understand the mental processes and social patterns of the masses. It is they who pull the wires which control the public mind. He obviously didn't really believe in democracy. Curtis also outlines a gradual change in views of how we deal with the subconscious stuff people have inside. Particularly he picks out Wilhelm Reich to represent the other pole. The other pole being the view that what is inside human beings will only appear crazy to the degree by it is repressed, by the individual and by society, and rather than repressing it further, it needs to come out and find healthy expression. So, for example, as opposed to Freud's idea of evil, out of control sexual urges that needed to be controlled, Reich preached healthy sexuality, better orgasms, expressing your real emotions, and that kind of thing. Freud's view initially won out, but later, after Reich's death, it became his angle that became one of the components of the human potential movement in the 60s. Then, suddenly we have Esalen and Werner Erhard, and lots of people who suggest that what one needs to do is to express what one really feels, and that one can take charge of one's own life, and live it on one's own terms. Not just put up with what society pushes on you. But big companies and politicians learned to adjust to that, through tools such as market research, focus groups, etc. Find out what people want, and appear to give it to them. Then, not only do you sell products, or people vote for you, but the people will think they did it of their own free choice, expressing their own individuality. The result became that it didn't really matter whether people were trying to conform and repress their inner urges, or whether they wanted to be self-actualized individuals. If you gauge what they want, and you give it to them, they will not even know how they're manipulated. A key point is that it is not really about what people really want. It is democracy based not on open dialogue about what really is important, but based on guessing which factors will make the most people feel satisfied, and giving them that. You know, read the inner desires of individuals, and fill them with products and campaign promises. What we live in is essentially societies that on the surface appear to be based on democracy and free markets, where everybody has a chance of making a difference, but where the reality is anything but. The people in power just apply different techniques for manipulating us, in whatever way is necessary to buy their products and keep them in power. Makes it all sound sort of gloomy, I guess. Nothing stops us from coming up with some anti-dotes, of course. But we haven't yet. You can find the videos on Google Video here: part 1, part 2, part 3, part 4. The happiest man in the world? To scientists, he is the world's happiest man. His level of mind control is astonishing and the upbeat impulses in his brain are off the scale. 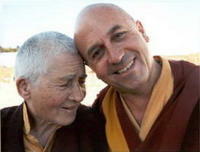 Now Matthieu Ricard, 60, a French academic-turned-Buddhist monk, is to share his secrets to make the world a happier place. The trick, he reckons, is to put some effort into it. In essence, happiness is a "skill" to be learned. His advice could not be more timely as tomorrow Britain will reach what, according to a scientific formula, is the most miserable day of the year. Tattered new year resolutions, the faded buzz of Christmas, debt, a lack of motivation and the winter weather conspire to create a peak of misery and gloom. But studies have shown that the mind can rise above it all to increase almost everyone's happiness. Mr Ricard, who is the French interpreter for Tibet's spiritual leader, the Dalai Lama, took part in trials to show that brain training in the form of meditation can cause an overwhelming change in levels of happiness. MRI scans showed that he and other long-term meditators - who had completed more than 10,000 hours each - experienced a huge level of "positive emotions" in the left pre-frontal cortex of the brain, which is associated with happiness. The right-hand side, which handles negative thoughts, is suppressed. 10,000 hours?!? Hopefully less can do it. I want to be really happy too, for no good reason.